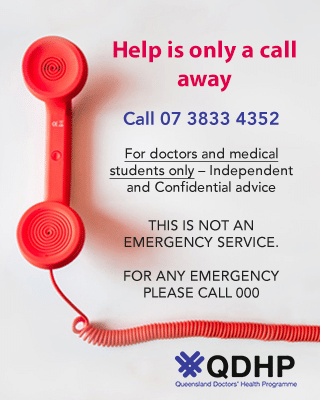 24/7 Helpline for doctors and medical students. Get a list of resources for doctors and medical students. If you are a DHAS(Q) member, please contact QDHP for login details. What is the Queensland Doctors’ Health Programme? The QDHP is an organisation established by the Doctors’ Health Advisory Service (Qld) to assist colleagues who may be in difficulty. Our aim is to support doctors and medical students in Queensland to achieve optimal health and well-being throughout their careers. Improving doctors’ health has benefits for the doctors themselves, their patients and the health care teams they work with. We understand the stressors of professional practice and the complexities of navigating training. Our service provides a helpline for advice and support plus education to improve understanding of doctors health and how to care for doctors as patients. We strongly advocate for physicians’ health and regularly collaborate with other organisations to support their work in the field of doctors’ health.